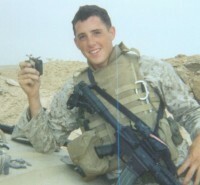 Marine Corporal Evan Morgan was on his second tour of duty in Iraq when the vehicle he was riding in was struck by a roadside bomb. Cpl Morgan, then 23, lost both legs and the sight in his right eye in the explosion. Homes For Our Troops is proud to have presented this home to Evan Morgan and his family on Nov.14, 2009. Thank you to all who supported his project.